I was a young man back then when I stumbled upon that old wicked Hawthorne tree. A young man with no understanding of what that day would bring…eternity. It was a warm spring day and the air was crisp, the forest smelled fresh. I had just finished working on O’Carroll’s farm, one of many a hard day tending the fields. A lot of men would complain by the ways of work but i enjoyed it and found it to be very therapeutic. I never tired to the amazement of my peers, how much work could one man do in one day? They used to mumble to each other. I would smile and nod like a fool and get on with my labours. This day as of many days I had started my trek back home through the forest to my village. I had walked but 20 to 30 minutes and the forest was thicker and the light drizzled through the dark roof above. I heard the sweet birds chirping merrily high up in the branches as if they were enjoying the same day as i. Every tree had a flock of birds sitting merrily tweeting, all trees except one tree, a tree that i had just noticed. The Hawthorne. It was a beautiful ancient tree full of grace with it’s own battered branches holding out their own against the winds of time. Arms stretching right to heaven as if in celebration to the one Christian God himself or possibly the devil. The Hawthorne tree was not natural. Not even close, it held secrets in its bark that went right to the deep underlying roots. I had heard many tales as a boy growing up in my village and that i should be be wary of this magnificent tree, to never break a branch or be doomed for eternity. The tree held a certain energy and as little children we used to find a tree that we thought might be a Hawthorne and bravely we would snap a twig off a tree. 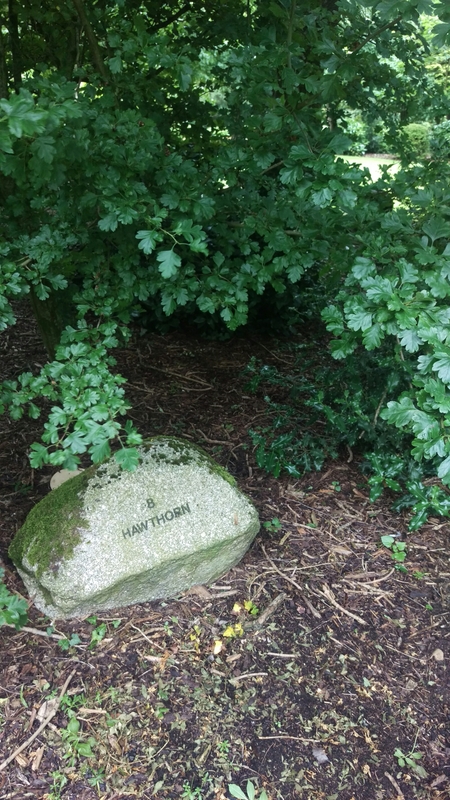 If i had of known i would never have even tried to break a branch, luckily not one of us had seen a real Hawthorne Tree. My thoughts broke from the childhood memories and i shook my head as if dazed and confused. I turned away from the tree being a little anxious but something caught my eye and i swiftly looked back. My eyes widened in shock as i looked on. I saw him. I could never forget him. His very existence was burned into my soul that day. I saw him slumped under that God awful Hawthorne tree, he was small in stature but the body was in proportion, about three foot tall he was. His little red hat was tipped over his one eye and a small tooting sound escaped from his mouth. He was sleeping soundly. I crouched down quickly as he stirred a little, he grumbled something discernible. It sounded like Gaelic but nothing i had ever heard before, it was melodious. I saw from my crouched position his little suit and it was the brightest burgundy with little shiny gold buttons, his shirt a fine white and braces the colour of night. The thing that amazed me was his shoes, so polished they were that it looked like black marble. His sleeping position made him look like a statue but I could see his chest slowly going up and down through his contented breathing. I crept slowly from my crouching position to get a better look, I had heard of the Leprechauns before but only in childhood stories, i could not believe this. I thought maybe Mr O’Carroll had worked me too hard today and this was the aftermath. Nevertheless I approached carefully towards this little creature, tooting from his sleep, I was so close to that cursed tree. I had no idea what i would do when i got near or if he ever woke up, my thoughts betrayed my body as suddenly before i could get any nearer a twig snapped under my foot, i cursed myself for being such a fool. This sleeping creature woke very quickly, his body popped up from the ground un-naturally and he twirled around three times until our eyes finally met. It seemed like a lifetime as he stared into my eyes and it seemed I’d stopped breathing. I shook off the spell that he was throwing my way, entrancing me into the other-world. The faerie folk were known for whisking people away by their magic and i needed to be alert. His eyes glowed angrily as if he had been caught out but he grinned as he saw I was still in my crouched position. He let out a merry little laugh as his eyes widened and relaxed. “Ah, ye got me there now! I was having a wee snooze. And who might you be? Friend or foe?” The creature said pointing a gnarly little finger my way. I stood up, feeling like a fool having been caught sneaking. I felt a bit ashamed that i had dared to intrude on a magical being by stealth. Maybe i should have just walked on. “My name is Fergal, just a man on his way home to his family” says I in a nervous, shaky tone. I did not know what was to become of me. “Ah, Fergal, well come sit with me” he ushered me over with his small hands patting beside him, he clicked his fingers and a wooden chair with a plush cushion atop appeared out of thin air beside him. “I’d like a wee chat wit you, if you be so kind”. His voice melodic and childlike. His eyes staring at me intently and his pupils looked like they had golden flames inside, i shook my head and whisked the magic away from me. I needed to be so careful, he was dangerous. A flash of anger crossed his face and was gone in an instant, he did not like the fact i didnt succumb to his devilish ways. Cautiously I sat beside him on this extremely comfortable chair, wondering what on earth I could talk to a leprechaun about. I needn’t have worried because he started anyway. His eyes narrowed a little as he looked up at me. “Why? What’s wrong with the gold?” I was excited by the notion of the gold, the leprechaun had a saddened expression on his face. He stroked his little beard in contemplation as if stretching through time into memories long past. He looked away from me towards the direction of the path to O’Carrolls. “I always get asked Fergal, the truth of the matter is that I dont actually know where it is. It’s beyond wishes now. You see I have been around for a long long long time, I hid it near my youngest age” the leprechauns wizened face shook with rage. “Just don’t wish it”. I sat there with the leprechaun in the stillness of the forest pondering what was to become of me, he would look up at me grinning every so often. Almost like he was reading my mind. “Hush!” he said and held up his hand. He kept looking around the forest, sniffing and cackling. It was horrific to look upon. I couldnt believe i was talking to this little creature, i promised myself in that moment to never utter it to anyone in the village as theyd think me mad. The priests would have me by the neck alone, id never go against them. “Yes Fergal! Keep it to yerself” the leprechaun said offhandedly as he was in contemplation. It shocked me that he read what seemed to be my mind. It suddenly dawned on me that I had never asked him his name. I looked at him and his mouth widened, grinning from ear to ear. He waved his hand and in front of us a banquet table appeared from thin air. A barrel of fine stout dropped on the table. Music was playing somewhere that he had magicked, fine fiddles and lutes playing and entrancing me. I got off the chair and felt the need to dance, he danced with me and he laughed which made me laugh. Suddenly his laughter turned to a menacing cackle and he stopped, he clicked his fingers once more. Chairs appeared and he bade me to sit, so I did. Now I don’t know what you’ve heard about the wee other crowd folk but they are tricksters and deceivers, liars and crooks. I was impressed by this little man but I was wary, this unknown creature was wily and i knew it well. I could tell by his eyes, they glowed with mischievousness and danger. “My name is Conarght” he said as if he read my mind earlier. With that sentence he finished with a sneer, almost like he felt contempt for even letting me know his name. He jumped high up and landed softly on the chair next to me, then bounced on to the table. Conarght did a little jig up and down this table, he was entertaining to watch and i found myself clapping to his jig. He waved his hand in two opposite circles, a mug appeared in each of his hands. One small red and gold lined and the other a bigger mug that was blue and silver lined. The mugs were both made of the finest metal and glistened with flecks of gold. He invited me to eat to which I politely declined as I had heard stories of folk disappearing after dining with the faerie folk. There was a flash of anger but it dissipated as we continued to converse in generalities. He told me of his many adventures in time long before i was there, he said that there were so many that he couldn’t talk about because there were ancient secrets he could not reveal. He told me of the old kings of ulster, the Fomarians and invaders of old Ireland to which I scoffed. He was displeased at my mockery, even punched the table hard that it felt like lightning struck and he put me right verbally. I longed for the stout as I was thirsty, he knew it. I reached for the cup, I noticed his eyes narrow and darken as i did so. I grabbed hold of my senses before it was too late, i would not be a prisoner to this imp. I put the cup straight down, so hard that the mug fell over and the liquid trickled out over the table. He glared, his eyes burned with hatred. “Fergal, in one way or another you will be staying here forever…with me.” He hissed and spat. I looked at him with contempt, i had heard about leprechauns and wishes and my heart started thumping. Maybe i could try this one last trick on him. So i began my gamble. “I have three wishes Conarght! I know well enough straight and true that you won’t hurt me until the three wishes are up!” I shot back with conviction. “Well…now…I suppose…” the leprechaun turned his head away, his eyes frantically turning from side to side, his tongue was out and seemed to touch his nose. I looked disgusted at the sight, his head turned quickly, twisting to look back at me and then back into the previous position. Deep in thought, his mouth turned into an evil grin and he looked back at me. “Four gold coins?” I asked in exasperation and worry “why ever would you offer these to me?”. “Ah, well there is a catch to it so there is” the leprechaun grinned menacingly “it’ll take four years to be rid of these, that’s one year for each coin”. The leprechaun rose to his feet and stared deep into my eyes. I felt his voice go straight to my soul as he uttered. “Be wary of your decision as I shall make your life worse than all the plight of Ireland. Worse than every disease in the known world. The worst luck to ever befall a human being, yes even worse than Cormack Mac Art who was stabbed by his own!” The leprechaun smiled menacingly and calmly sat down “or you could do the tasks I ask” he twirled his little finger around his Brown beard. He hummed a little merry tune. I was scared beyond measure, how could I defy the little creature. He had me ensnared, I knew it and he knew it. “Well I guess I have no choice Conarght. What are the tasks?” I asked worried about what it entailed. He put out a long finger and slowly tipped his hat down, the table dissipated and all the objects faded away. He sat under that Hawthorne tree in the position i had found him. I looked at him in horror, his one eye peeping from under the hat menacingly. It was indeed getting dark and i decided to run home as quick as i could, i heard cackling in the background as if he was following me home. This was the day i had met the Devil.